Joe Root will be relieved to see Ben Stokes return to Test cricket for several compelling reasons. Most obvious is that Stokes - especially if fit as expected to bowl as well as bat against New Zealand in Auckland - brings the game-changing brilliance Root's England had to do without in this winter's Ashes. In Stokes' absence, a 4-0 drubbing took England's miserable form away from home in Test cricket to one series win in eight - dating back to before their last trip to New Zealand in 2013. The other half of the Stokes equation is that, once playing again, he has a perfect release valve for his all-action enthusiasm. 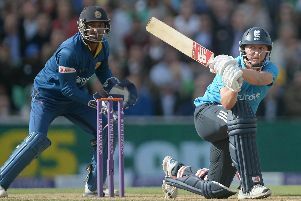 Asked if it can be a challenge to contain Stokes' cricketing energy between matches, Root said: "You have to try. "There's only so much you can stop him doing. He's just desperate to play." It is a quality Root admires. "It's been a while since he's had the chance to play red-ball cricket - he's just so excited, and you don't want to take that out of him," the Yorkshireman said. "It is really good to see players with that attitude and so desperate to come back in and prove a point and do well." Stokes was unavailable through the majority of the winter, waiting until the new year to hear he would be charged with affray following an altercation outside a Bristol nightclub last September. England prize him as their outstanding talent with bat, ball and in the field. "You get three players with Ben, and certainly on his day probably the best three players within the side all in one," Root said. "It is a huge boost to have him coming back into the team. "We have to be quite careful and make sure he is absolutely ready and be quite flexible with how we use him, especially in the first Test. "He's very focused on what he needs to do. Credit to him, he's been able to manage that really well." It is not just Stokes' deeds on the pitch which can revitalise Root's team. "When he speaks about the game, he gets everyone's attention - and people listen," the captain added. "I suppose that is the natural leader in Ben... and if he can drag players along with him then brilliant." There is one caveat, that Stokes will take the field just one more misdemeanour away from incurring the demerit point to trigger an International Cricket Council ban of one Test or two one-day internationals. "You're always aware of that ... he'll have to be on best behaviour," said Root, who is hoping Stokes' return can coincide with a much-needed improvement on England's Test travels. "It has been a tough winter until now, but we have two Test matches to put a different stamp on it and change our momentum. "It is a big series for us coming from a big defeat like the Ashes, so we need to make sure we put that right and come away with some success overseas - because it's not happened for a while." Test wins away from home are a rare occurrence not just for England but all teams. Root added: "It is one of the biggest challenges ... to go overseas and adapt well to conditions and get something from the series. "It's trying to get the balance of it all right... making sure there's nothing too radical and so extreme that no-one understands, but trying to maximise everyone's skills in the conditions."